Aircraft tire refers to rubber tire used for aircraft, of which the size is generally 6.00-5 or above. Considering harsh environment, fast speed, huge impact force etc., hot retreading (mold retreading) is more suitable for aircraft tire. 1. Rich experience and excellent technique with over 30 years retreading experience. China's largest tire retreading equipment manufacturer. 2. High specialization. 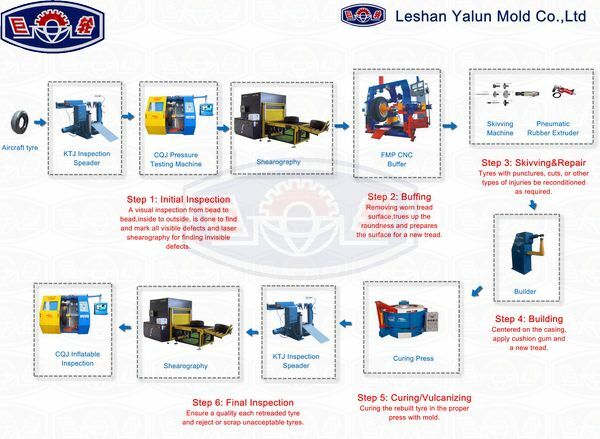 Yalun is specializing in manufacturing tire retreading equipments which offers full-range service, covering plant planning, consultation, technique support and after-sales service. 3. Customization. Yalun can customize equipments on clients' requirements and design reasonable retreading method. 4. High quality and credit standing, cost-effective. Initial inspection for aircraft tire is to do visual inspection and press testing inspection to decide whether the tire can be retreaded or not. Equipments involved: Inspector KTJ, pressure testing machine CQJ, shearography. Buffing is to remove the old, worn tread surface. Before buffing, put tire in FMP and inflate it. Choose the parameter option in user interface according to different sizes and then buffing machine will operate automatically. Skiving means polishing the mendable broken parts and then repairing the small holes. Tire building means gluing cushion gum and suited tread to the polished tire under the help of tire builder. Curing is a process of integrating unprocessed tread rubber and casing. During the curing process, tread rubber will gradually become tough, durable and with good driving. Firstly, Put pre-cured tire into the mold and close it. Then, inflate the tire to proper curing pressure. As a result, inflated tire will press uncured tread into the mold and patterns on tread will take shape. After a certain time of heat and pressure, the cure of tire will be done. Final Inspection is to inspect all the treated tires thoroughly to make sure high quality.